The network of sophisticated and intricate irrigation systems is one of the main features at Angkor and is the key element to double rice harvests each year leading to the great prosperity the Khmer Empires enjoyed. Prior to the 16th century, Angkor was known as Pisnulok, after its original founder Suryavarman II. The Royals used the Terrace of the Elephants within Angkor Thom as a viewing stage during grandiose parties. The first-ever Western visitor at Angkor was a Portugese monk named da Magdalena, who arrived in 1586. The temples of Angkor are some of the two greatest ancient temples within Southeast Asia, the other being Myanmar’s Bagan Temple complex. 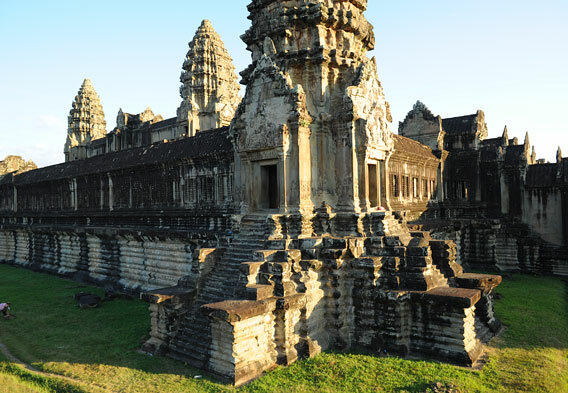 The complex encompasses the remains of several Khmer capitals spanning the 9th to 15th centuries. Constructed between 802 AD and 1220 AD, Angkor Thom and the surrounding Angkor temples represent one of the most magnificent prevailing architectural masterpieces known to man. The region is believed to have been chosen for its beneficial agricultural and military position. Interestingly, the primary temples were discovered to have emulated the Draco constellations existing in 10,500 BC during the spring equinox. 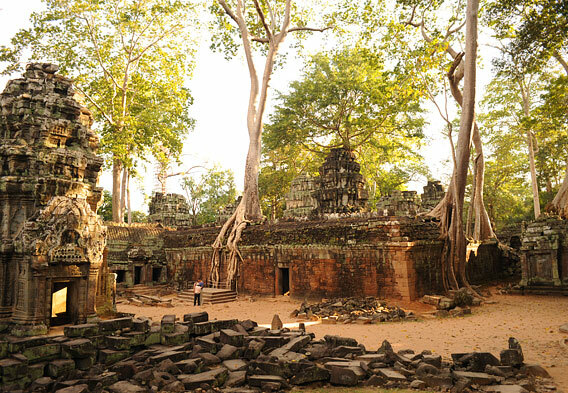 A vast area reaching beyond China was ruled by Khmer kings during Angkor’s prime period. Today at Angkor, more than 110 stone wats, or temples, symbolize the extensive religious, administrative, and social capital while hundreds of other houses, palaces, and other edifices, all part of the Khmer empire, have long since crumbled and disappeared. Angkor Thom, meaning Greatest City, is best-known for an incredible 148-foot centric temple, called the Bayon and located near Baphuon. The numerous features and temples of Angkor Thom are not to missed; preceding the southern gate, the entry is adorned with monsters and gods said to be vying with the Khmer for the “sea of milk” that was believed to be the key to the genesis of the world. The gates of Angkor Thom illustrate intricate carvings of the head of King Jayavarman, a noticeable adornment throughout. At Bayon throughout the first level there are ornate reliefs: Terrace of Elephants and Terrace of the Leper King. This magnificent temple features a lotus shape created by the four towers built into the four main corners. It is the biggest and most captivating of all Angkor temples, built by King Suryavaram II during the 12th century to honor Vishnu, the Hindu god, and represent the Hindu cosmos. The inner moats and walls of Angkor Wat are nested congruently in rectangular shapes symbolizing ocean cosmology and mountain chains. The temple dimensions follow a north-south axis while the eats-west axis is purposely diverted just slightly to offer onlookers anticipation of the equinox several days prior. Ta Prohm is one of the most breathtaking temples of Angkor and bears vital importance for it is still in almost original form. Built by Jayavarman VII who was a famous warrior, the late-12th century temple is preserved incredibly by the dense jungle forest it was blanketed in. Ta Prohm roofs, walls, courtyards, and chambers have been restored to halt any further atrophy. The inner temple has been cleared of thick, jungle brush with the outer area left gripped by the trees, creating a most memorable image. Ancient temple stones are forced open by cagey roots while monolithic trunks sit upon the main Buddhist sanctuary. 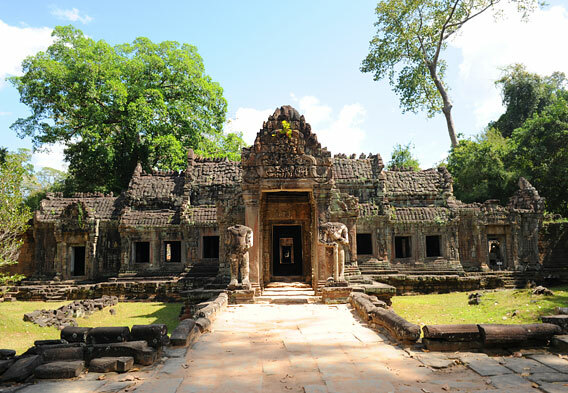 Constructed at the turn of the 12th century, Preah Khan came to exist in the same period as Ta Prohm—both dedications to the great victories under the rule of Jayavarman VII. The grounds were a dedicated learning center, once home to palaces of previous Khmer kings, represented significant placement within the complex. It was a temple but also a complete city encompassing a smaller village. It comprised more than 130 acres and home to tens of thousands of farmers producing vast amounts of rice, feeding students, monks, and teachers. Beginning at the eastern entrance and ending at the west deserves a good hour and half exploration.